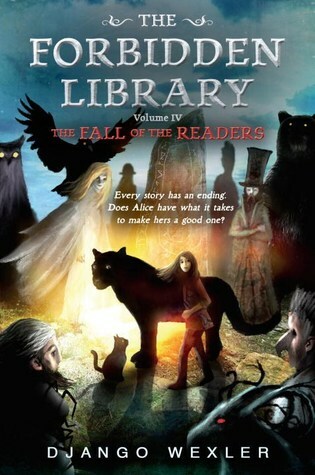 Django Wexler’s outstanding Middle Grade series The Forbidden Library comes full circle in The Fall of the Readers, the concluding volume of this richly dark and enchanting adventure through the magical world of books. So far we’ve seen the young protagonist Alice through some very harrowing times, following her as she visits new worlds and encounters their strange and whimsical inhabitants—some of whom turn out to be allies, while others reveal themselves to be fiendish and dangerous enemies. But now, Alice is about to face her biggest challenge. If you’re not caught up with this series yet, please be aware that this review may contain spoilers for the previous three books, because The Fall of the Readers is definitely not meant to be read on its own. This fourth and final installment wraps up a saga that has been long in the making. It all began with the disappearance of Alice’s father which landed her in the care of her uncle Geryon, a crotchety old man who actually turned out to be a member of a ruthless organization of sorcerers known as the Readers. To her shock, Alice discovered that she has the same magical powers that allow her to enter the world of certain books, enabling her to subdue and bind the nasty creatures locked within to harness their special abilities. Although she agreed to study as Geryon’s apprentice, it soon became clear that her uncle may have had something to do with her father’s disappearance. Stricken, Alice decided to strike back, but in doing so, she also incurred the wrath of the older and more powerful Readers who are now targeting her and her friends in retribution. Desperate for a way to safeguard those she cares about, Alice decides to turn to the powerful cat-like entity known as Ending for a way to defeat the old Readers once and for all. The mysterious Labyrinthine reveals that in fact there is a way—but Alice probably won’t like it. The plan will involve great risk to our protagonist and her friends, as well as all the otherworldly creatures they’ve agreed to protect. But with the old Readers’ attacks growing more frequent, Alice knows it’s only a matter of time before her defenses will fall, and since surrender is not an option, it is better to take the chance and hope for success. Better to go down fighting than to sit and watch as the enemy destroys you little by little over time. This being the last book, there is a distinct sense of urgency to the story which keeps any digressions and mini side-plots to a minimum. In every aspect that counts though, Wexler comes through with flying colors, conceding no ground in areas like character and story development. The Fall of the Readers basically thrives on its plot, the book’s greatest strength proving to be its ability to make you want to turning the pages and never put it down. As a result, this was a lightning quick read for me, but it’s important to note that the pacing still remained well-balanced and appropriate for the different events of the story. But the most amazing thing about this book is Alice. Not only is she a heroine you want to root for, she’s also one you’d definitely want on your side. She’s smart, brave, and strong. She’s an amazing friend and role model, as well as a leader who takes charge. But because she’s young and still learning a lot about the burdens of responsibility, the pressure of so many lives depending on her can sometimes lead her to make rash decisions. This book sees Alice growing up fast, having to learn to deal with the consequences of her mistakes, but instead of growing more jaded with her failures, she simply becomes even more determined. Because the story itself is so streamlined though, this does leave little room for other characters to play much of a role. But ultimately this might not even be an issue, given the way we’ve been made to care so much about Alice, thus conveying the understanding that this series has always been about her journey, and now only she—and she alone—can see it through to the end. My only disappointment in this is the fact that we got to see much less of favorites like Isaac and Ashes the talking cat. Still, I believe Wexler was fully aware of this, because he also made sure to make the most out the scenes between Alice and Isaac, continuing to develop their friendship and perhaps nudge it towards something more, and yes, thankfully we still get plenty of Ashes’ epic snark! Of course, the world-building was also fantastic, and what impressed me was seeing how all the elements of the world finally came together in this climactic conclusion. There was a big twist near the end that I wish I could have said I saw coming, since I pride myself on paying attention to the details, but the truth is, the author was imply very clever and subtle in his foreshadowing and hint dropping. Like all good endings, The Fall of the Readers managed to unite the various themes and elements from the previous books, gradually building tension and momentum until events culminate in an epic showdown. This novel has everything you want in a finale, from excitement and suspense to tenderness and heartbreak. I think fans of the series, no matter how old you are, will be very happy at how things play out. I know I am! The Forbidden Library is another winner from Django Wexler, a series of magical and endearing books that I would not hesitate recommending to children and adults alike. Nice review I have been interested in this series for a while even though its not my normal cup of tea. I am pretty sure he gave me a signed book plate for book one a few years ago. I will soon be posting a interview and a review of Django’s other series end that will be out in January. The final book is called the Infernal Battalion and he sure knows how to end (and begin and do stuff in the middle) a series I guess. Less of the talking cat? Blasphemy! Everything looks really good, the world, alice, the story! I didn’t know about this one but I want to try! I like the sound of this and may see if my library has any of these. I do admit the cover has me very intrigued. Great review! I met the author once and he was extremely nice, although I feel bad because I have yet to read any of his books. I’ve been reading your reviews of this series over the years and I’m very curious to try it out, one day perhaps when life slows down! Glad to hear the series is still going strong! Glad you loved it – great review. I liked the first book in this series but I didn’t love it the way everyone else seems to. I’m tempted to pick up the sequels to see if I can figure out what I missed the first time around!